Little Beaver’s Towable Hydraulic Earth Drill combines safe and powerful drilling with hassle-free operation and transportation. Its balanced frame reduces operating weight by roughly 50 percent and requires less than 20 lbs. of force to pivot into digging position. The frame also eliminates torque for safe one-person drilling. The drill’s 34-in. 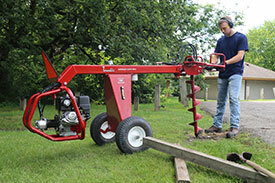 width allows it to fit easily through gates and tight spaces inaccessible to skid steers and tractors. The Towable can be conveniently transported using a removable “no tools” towing hitch and is an economical tool for landscape contractors.